Obviously, it is out of question for me to go empty-handed. Christmas is my favourite period in the year. You spend more time in family, of course it’s a holiday! But I am more the kind of person who likes to offer than receive. It gives me so much joy to look for the perfect present that would provide a smile of the person’s face. This year, I decided to give homemade presents. I personally think, you don’t need to go to a store and buy an expensive item. The perfect gift for me is something you will actually use and will think about me when you use it. A chocolate chips cookie jar. 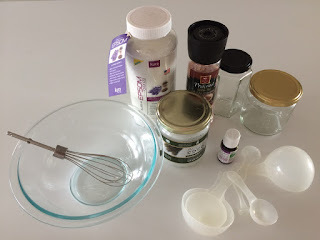 I filled the jar with the flour, the sugars – there are two kinds, the pinch of salt, the baking soda and the chocolate chips. She just needs to add a softened butter and a large egg. 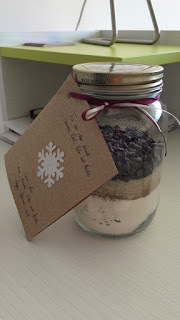 I wrote the instructions on a paper and tied it on the jar’s lid with some ribbons. 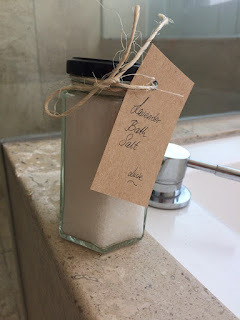 An homemade lavender bath salt. I mixed 1 cup of lavender Epsom salt with few drops of lavender essential oil, a teaspoon of pink Himalayan salt and a little bit of melted coconut oil. I hope she will like the ideas and maybe you will like it too.